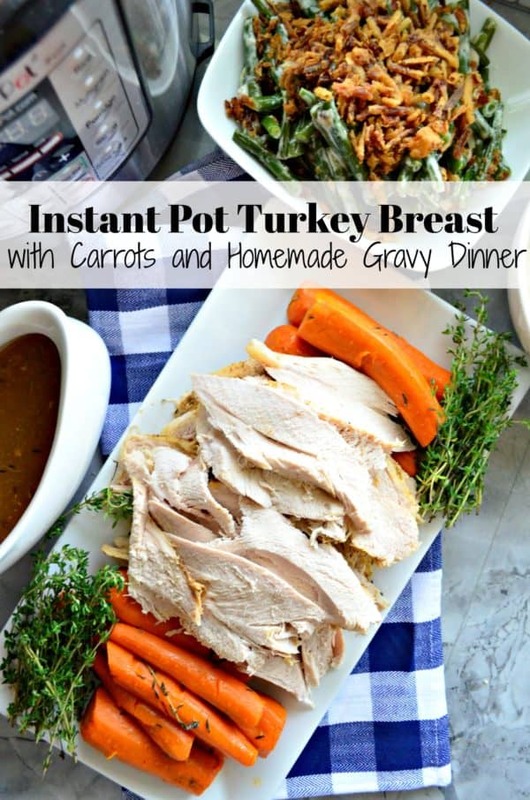 Celebrate the holidays with ease with my delicious and easy recipe for Instant Pot Turkey Breast with Carrots and Homemade Gravy recipe. I know it’s only September, but we are about to approach another holiday season. Since I’ve fully embraced my Instant Pot over the past year I decided to finally start testing recipes for a turkey breast in the Instant Pot. Once again, I’ve got another game-changing recipe. 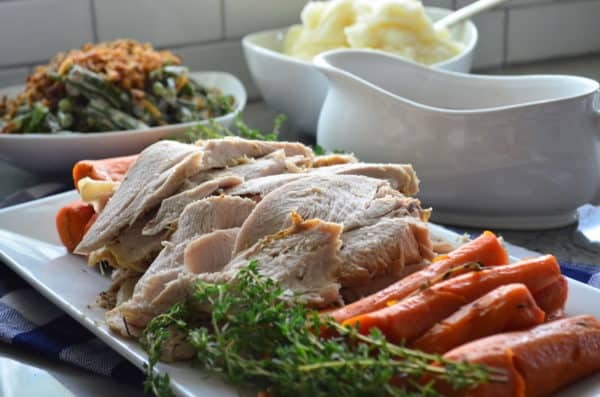 This recipe for Instant Pot Turkey Breast with Carrots and Homemade Gravy not only has your turkey breast done within an hours time. It gives you a side of fork-tender carrots and the most delicious from-scratch gravy. 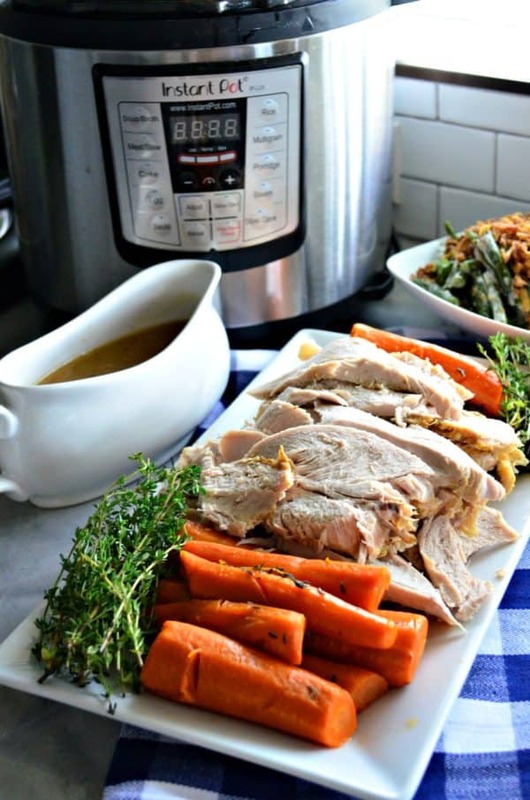 What size turkey breast can you fit in an Instant Pot? I’ve tested this recipe two times now and feel very confident with it. Especially since my husband proclaimed this recipe to be better then my oven-roasted recipe. Your cooking times will vary a little bit depending on the size of your turkey breast. You can cook a 5.5 pound turkey breast for 20 minutes with a 10 minute rest time. Now–remember, you need to count on an additional 20-30 minutes for the Instant Pot to come to pressure before the count down on the 20 minute timer begins. I like to start this recipe 1.5 hours before. I also like to let the turkey rest while the gravy is being made before I carve the turkey. 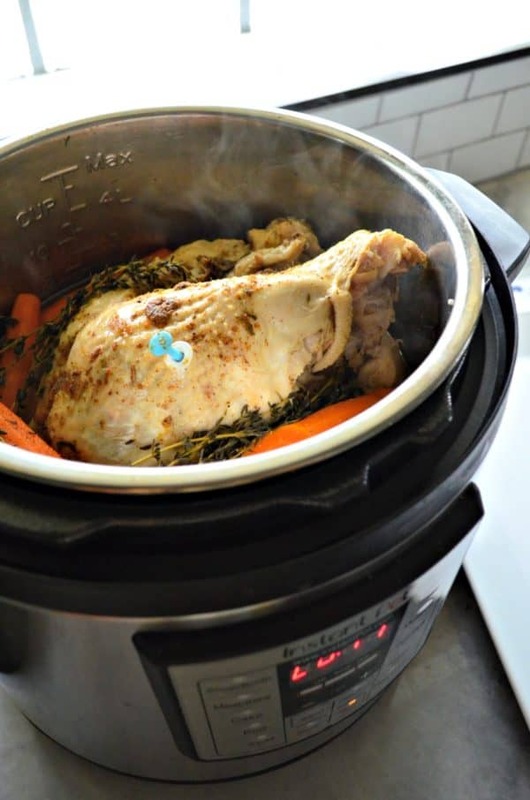 What size Instant Pot do you use to cook a turkey breast? I have a 6 quart Instant Pot. Before you go to cook your turkey breast I suggest you put it inside the Instant Pot to ensure it will fit inside. Keep the wrapper on–this is a great step to do before you start to brine. If you have an 8 quart you can definitely cook a little bit larger of a turkey breast. The largest I’ve been able to cook to date is a 6.5 pound bone-in turkey breast. Remember if you cook a larger turkey breast you will need to adjust your time by 5-10 minutes longer. I tested this recipe both ways, and by far the winner of the two was the brined turkey breast. It was not only moist but much more flavorful. I recommend you let the turkey sit in brine for 12-24 hours. Brining not only gives the meat additional flavors, but it helps keep the white meat moist. I’ll gladly trade slaving over the oven for 2.5-3.5 hours for only an hour of cook time. Even better, no basting, turning, and all that jazz which comes with roasting a turkey in the oven. My family doesn’t eat the skin–so crispy skin isn’t something I need to worry about. However, if you like crispy skin all you need to do is throw the cooked turkey breast under the broiler in your oven for 1-2 minutes or until golden brown. Do not step away from your oven–watch that skin like a hawk watching it’s pray. What sides should I make with a turkey breast? 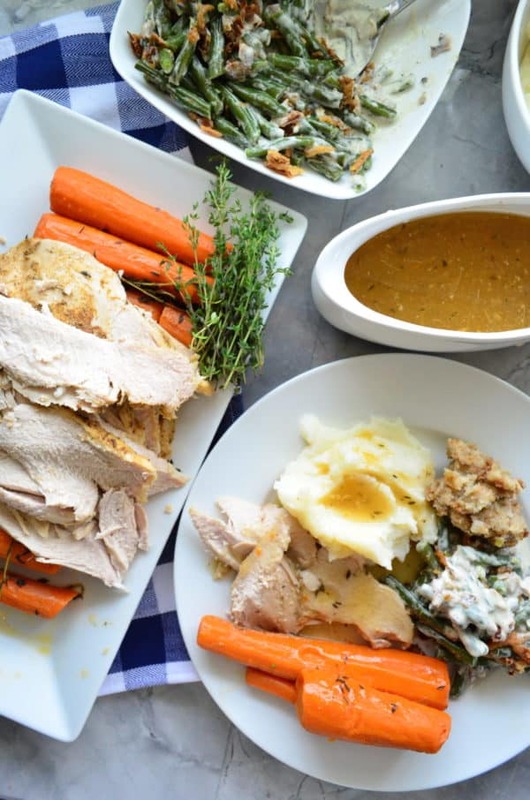 So if you’re like me, and always trying to find ways to simplify your meals you will definitely want to try this recipe for Instant Pot Turkey Breast with Carrots and Homemade Gravy. How much fresh thyme? And your note at the end—isn’t a 5 1/2 lb. turkey breast the same as 5.5 lbs? What am I missing? Hi Valerie, Yes both are the same. In the recipe I use 1 teaspoon dried thyme for the rub. Hope you enjoy this recipe as much as my family did!